Another important structure in the Kathmandu Durbar area, Hanuman Dhoka is the the first thing that welcomes you in the Durbar. A 17th century statue of Hanuman, the Monkey god guarding over the Dhoka (door/gate) gives it the name it has today. The structure dates back to 16th century and has been reconstructed and expanded by the Malla kings later. 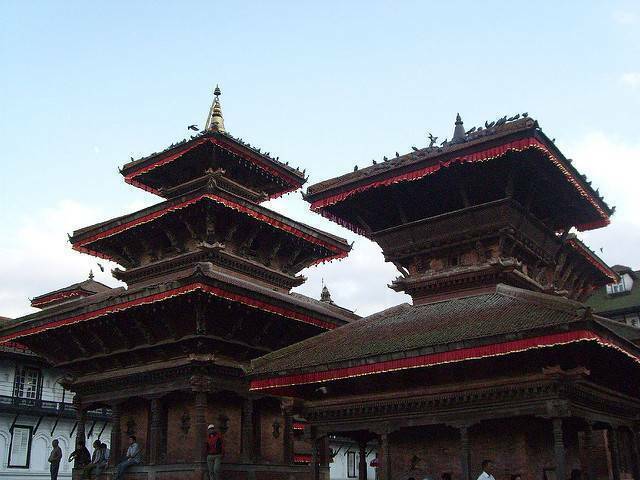 Recognized as a world Heritage site, this Hanuman Dhoka Durbaar is what housed the royal family before the period of 1880’s and thereafter they shifted to the Narayanhiti palace, leaving this place to be symbolized as the glorious gem depicting the royal life, the cultural and traditional beliefs in Nepal. However sadly the Hanuman Dhoka experienced a hard hit by the earthquake of 2015 damaging it from many places, the reconstruction work has been going on and entrance for public is restricted. Once the palace is reconstructed and fit to visit it’ll be open for the public to view what a marvel it was. As you enter the palace, there comes The Nasal chowk (courtyard), earlier used for events like the coronation of the kings. Then comes the Panch Mukhi Hanuman temple, famous for its 5 circular roofs. Followed by Mul chowk and Mohan chowk, the former a courtyard dedicated to Goddess Taleju and the later a residential area of the Malla kings which is restricted for public use. Then comes the Tribhuvan museum which is one of the most excellent source of getting a personal and up close view of the kings and their belongings. Sadly the earthquake has effected majority of areas and it’s unclear as to when the public will be able to experience these wonders again.